Two years in Apple Maps finally launched Apple Maps Connect, a service for small businesses to update and add their business listing information to Apple Maps. According to Greg Sterling the service is “intended for small business owners or their authorized representatives (though not agencies) to be able to quickly and easily add content directly to Apple Maps”. In true Apple fashion, Apple Connect is pretty easy to use and nicely designed. You just sign in with your Apple ID (or create one if you don’t have one), search for your business in Apple’s database and verify that you are either the owner or the authorized representative via phone verification. Once you have verified the business, you can update the data. 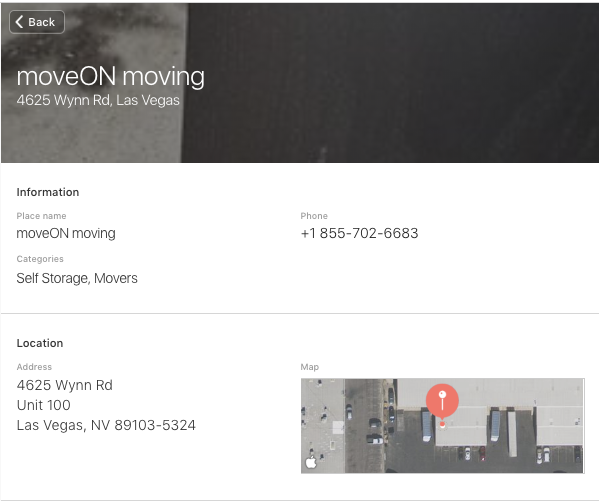 For example, here’s the Maps Connect profile for moveON moving, a fine Las Vegas moving company. Categories (you can select 3 top level categories and a sub-category for each such as Pets > Animal Shelters). You can also suggest categories. – The first 3 times I tried phone verification it took over thirty minutes to get a call. Each time you try, you are asked to wait 5-25 minutes before you try again. Justin Mosbach pinged me to say that he had had some success logging out and logging back in to reset the clock so you could try again immediately. My guess is the wait is totally dependent on call volume so for now try it at odd hours. – Although I have verified my business, I was unable to submit the updates on the screen where you update your data, but when I went back to the main page for my business via the nav links, I was able to submit it. 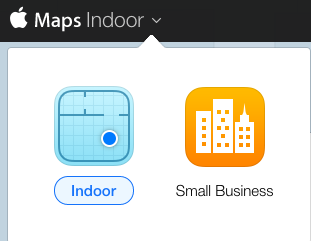 One point of interest: There’s a promotion for iBeacon called “Maps Indoor”. You need to have annual visits of more than 1 million people to get in early so most of you can relax. Does it work for multi-location businesses? Apple Maps Connect currently only supports businesses in the U.S.
How long will it take for your edits to go live? Updates can take one week, but data flagged for additional verification may delay this process. You will receive an email notification when your edits are published. What if your business has moved or closed? To use Maps Connect, you must be able to answer the business’ former telephone number. If you can answer it, please edit the profile to indicate that the place has moved or closed. If you cannot answer the former number, then please find the business via the Apple Maps app on an iPhone, iPad, or Mac, and click “Report a Problem” to notify Apple that the business is no longer open at that location. Using an email address that matches the business’ website will speed up approval (eg. www.apple.com and you@apple.com). Apple only accepts businesses where it can confirm a physical presence. Businesses that may not be approved include: home-based businesses, businesses with temporary locations or without a physical address, or businesses that have not yet opened for business. What About Different Businesses at the Same Address? Apple states you should create only one profile per physical location having a distinct purpose. Departments with clearly separate purposes may have a separate profile. My recommendation is make sure each department has a unique phone number. What About Businesses Like Lawyers With Multiple Practitioners? How Do You Close a Business in Apple Maps? Apple’s process currently requires that you must be able to still answer the closed business’ phone number before you can close a business. If you can no longer answer the former number, you can report a problem from the business profile on Apple Maps from your iPad, iPhone, or Mac. Your name should be listed as a customer would see it from your external sign. Your business name must include the brand (eg. Mike’s Chicken Shack) with an optional category (eg. Restaurant). Your business name must not include promotional phrases, location details, phone numbers, or other details that are not your true business name. In my tests Apple Maps seems highly sensitive to keywords in the business name so get ready for a lot of optional category SPAM. Can You Use P.O. Boxes? Customers must be able to visit your business at your location. Do not enter PO Boxes or other addresses where your employees are not physically present during business hours. Can You Use a Forwarded Phone Number? Redirected numbers will not be accepted. It’s unclear to me how they can enforce this as many local businesses redirect their phone numbers to call centers. Apple states that the website you link to from your Apple Maps listing should be “optimized for mobile screens”. What If Your Submission Is Not Approved? Apple will notify you and you can reply requesting a manual review. How Do You Update Your Business Photo on Apple Maps? Photos currently come from Yelp so update your photo on Yelp. Why Can Your Business Data Change Even After You Have Claimed Your Listing? Here’s what Apple says: “We receive profile information from many sources. It’s possible one of these sources believed that they had more recent information. If the information now displayed by Apple Maps is inaccurate, please resubmit an update.” This means that you will still need to make sure your data is in good shape at Apple Maps different business listings suppliers. No Business Claiming for Apple Maps for iOS8? Is Apple Maps Working Directly With Retailers? Thanks for staying on top of Apple Maps. I tried to claim my business and found an interesting wrinkle. Have you experienced something like this? Any advice? I haven’t tried it on a forwarded number, but per #12 in the FAQ this is against Apple Maps’ guidelines. Seems like this is going to be a huge issue for a lot of businesses. I haven’t tried this yet, but perhaps try to add a non-forwarded number and then try to change it once it’s been accepted. But I would give this low odds of working, particularly if Apple is bouncing your submitted data off its data from Yelp, Factual, Localeze & Axciom which probably use the forwarded number. Andrew – have you figured out how they handle a call menu? Its not a forwarded number, but the typical “press 1” type of menu when you call. verification is *%$^$. It could also just be me. Mike mentioned on his post that some PBX phones or Google Voice numbers could experience problems. Just tried it. We had no issues with the phone verification (what a pleasant surprise) and the automated call was placed almost instantaneously. However, when I completed the listing, it still said I had to verify the phone number :-(. And even your tip above, about going back to the main page via the nav links didn’t work. Any other ideas? I am guessing that’s a bug and will disappear. Andrew, would you recommend setting up a unique Apple ID for each client or put all under one? A tough one Jim. I probably screwed up by putting LSG under my personal Apple ID. At the least you should create a corporate Apple ID. That said, in Greg Sterling’s article, they specifically told him “not for agencies” so I suspect they don’t want you adding a large number of different business listings to one account. While dealing with a lot of different Apple IDs is painful, I think it’s ultimately in the client’s best interest to have their own Apple ID account. If you part ways, who knows how hard it will be to give the client access if they are all in the same account? I just used it for a small smb and the process was smooth as silk. The smb was already in AMaps so I added a couple of points and verified. As to some of the issues noted above….other verification systems encounter similar problems for verification…so Apple will have to work out kinks….but for simpler smbs with simpler phone systems this was sweet. At least getting the data in. We’ll see how long verification takes. Its been 2 weeks and Apple hasn’t verified the claimed listing. I wonder what is taking so long? Got an update message from apple. Claimed listing approved. That is about 3 to 4 weeks. Only for business locations inside the US? It would seem that you can now use this in the UK, except when I try to verify our phone number the phone rings once and then cuts off. We have a phone system here (PBX?) and I wonder if it is this? Has anyone got it working with a PBX? Hi Eddie, no it has been opened to a couple more UK among them. I tried to enter a pause in the number with an extension (ie +44 1566 555555 ,1) but their system just takes it out. Anyone had anyluck? we have a VMO forwarding system that is managed remotely at our phone companies headquarters. Unfortunately Apple in their wisdom didn’t think to offer any other method of verification other than phone. Since our system is multi-line it doesn’t work for us. I thought I had found a work around by removing all but one of the lines and setting up a direct forward but when I tried it the automated apple system calls the store to tell me that it has detected a forwarded line and will not allow me to verify over a forwarded line. Phone, it sounds like as long as you have the VMO system you will have this problem. Your best bet is to fix your data via Report a Problem and via Apple Maps’ data providers and wait for it to update. The phone verification process has not worked when you use an 855 phone number. Any ideas on how to fix this issue? Can anyone tell me why after I’ve verified phone number. I can’t submit review due to “unusual hours”. But those are the hours I operate. I haven’t seen that issue before. What are your hours and where are you located? Can you post a screenshot? Is it possible the hours on your site are different than those you submitted to AM? Having issues with ‘unusual hours’ too. We are a hotel so I’m assuming apple think we should be 24 hours – I have put down our bar hours as I think they are more relevant. They (after 3 weeks) have emailed back asking me to “Please confirm that your open hours are correct and that they match what is publicly displayed on your official website” I am fully happy to change it to whatever they like which will get us listed fastest, but when I log in, and hit ‘view my business’ I get served a blank screen. This wasn’t the case last time I logged in to submit the original details. I’ve tried with laptop (chrome and safari) ipad and iphone. Just need it to work. If anyone has any idea – or a contact who can just sort this for me, I’ll be very grateful! I ‘m having issues where it has had the status of “analyzing” for a few days and I can’t even press submit – can anyone help as I’ve had no joy googling for answers? I have the same problem for a month now, not sure how do you solve this issue?